Sunless Tanning Application Tips + A GIVEAWAY! Hey lovelies, I’ve been using some super fab natural sunless tanner the last few weeks and couldn’t be happier with the nice golden natural-looking tan it has given me! So much, that I’m giving my lovely readers the chance to win it for themselves! 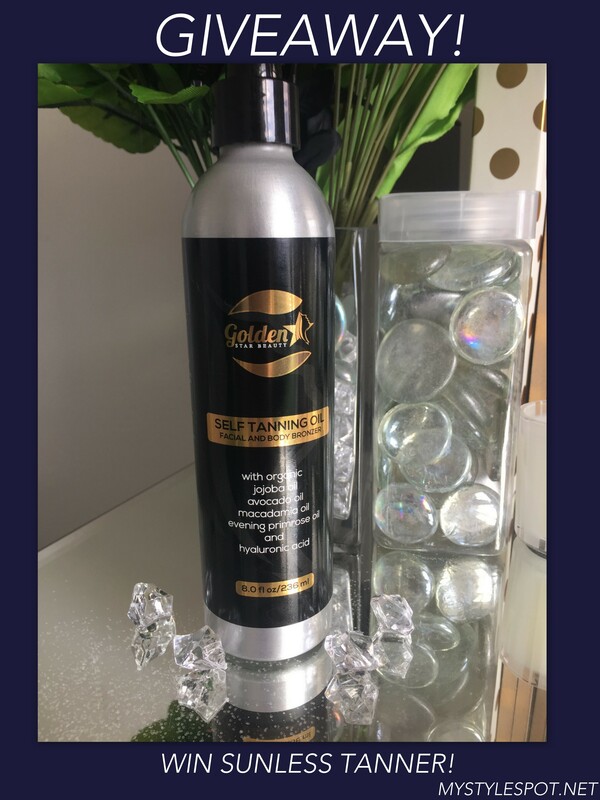 ENTER TO WIN Golden Star’s Natural Sunless Tanner in the rafflecopter form below! This sunless tanner is absolutely orange and streak-free! It’s also so incredibly moisturizing thanks to containing ingredients such as jojoba oil and avocado oil, that it totally replaces the need to apply lotion out of the shower too! 1. Apply self-tanning oil to body. 2. Wash hands with soap, paying special attention to wash cuticle and around nails where skin tends to be drier. 3. Apply a bit of tanning oil (1-2 gushes per hand) to a kabuki makeup brush and apply it to upper side of palms. Do not apply directly around nails. 4. Apply same way to feet, avoiding area around toes, to get a natural sun kissed look! ENTER TO WIN This Sunless Tanner! Sorry, Open to US only! *This is a sponsored video. However, all thoughts and opinions expressed are solely my own. I only share reviews with my viewers, I feel will be beneficial or informative in some way. I’d Love to eat a nice glow for the holidays coming up. I live in Arizona where the vitamin d is never in short supply, and I still can’t tan. I would love to have a natural looking glow for our family get together after the holidays so my family can stop making jokes about my pastiness hahaha. I don’t have anything specific coming up, but I just feel more confident with a glow to my skin! God bless and good luck everyone! My daughter is getting married in March 2017 and the first functions begin this month. I would like to have some color at these events. I would love to be glowing for my upcoming trip to a wellness resort in Mexico! I have two weddings that I have to attend this winter.